If you've ever wondered what to do with crushed potato chips and preferred something sweet, why not make cookies?! My friend Liz made these cookies for our annual holiday cooking exchange this year and they were a hit. I love the crisp texture the potato chips offered and don't worry - you won't taste any salty chips when biting into these! Cream the butter, 1/2 c sugar and vanilla. Add pecans and potato chips - stir well. Form into balls (1T each). Place on ungreased baking sheet. glass in sugar before each cookie. Bake until light golden brown, 14 to 16 minutes. Ha, I've made these. They were surprisingly good! I dated a guy once whose mom made these all the time. The worst part about breaking up w/ him was not getting her recipe first! Thanks! What an interesting idea! 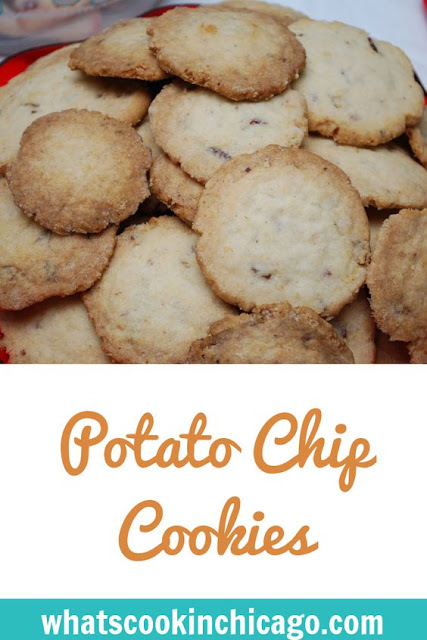 I would have never thought to put potato chips in a cookie, but they look really tasty. What a cool idea! I do love eating potato chips and fries with sweet things--like shakes.